Marconi and his receiving apparatus at Signal Hill, St. John's, December 1901. Amateurs are generally credited with discovering short wave propagation, but the original (and self-proclaimed) amateur Marconi may have unknowingly discovered it by accident long before we did. This article commemorates the 100th anniversary of Marconi's famous experiment in Newfoundland. 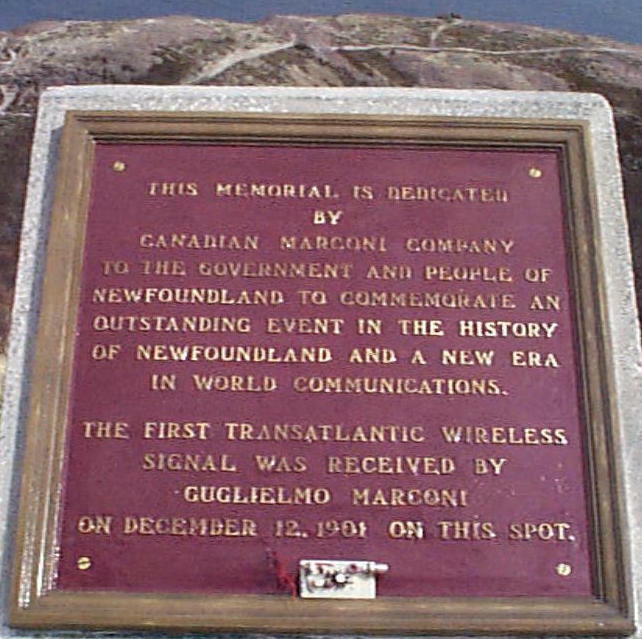 It was on the 12th hour of the 12th day of the 12th month that Marconi received the first transatlantic radio signal on Signal Hill in 1901. His claim was met with some scepticism; Edison thought Marconi may have heard static instead of signals and the scientists, unaware of the ionosphere, thought the earth's curvature would preclude distant transmission of radio signals. The F layers of the ionosphere reflect short waves and the D layer absorbs long waves during the hours of daylight which was when the signals were received. It is unlikely, therefore, that long waves would propagate across the Atlantic, and very unlikely that, even under exceptional conditions, long waves could be detected with the apparatus Marconi was using. If he detected the signals from Poldhu, they would have to be short waves, probably in the upper limit of the 5-15 MHz range, bearing in mind the path and the prevailing solar minimum of 1901. Contemporary references to the 1901 Poldhu transmitter have specified the frequency of the Poldhu transmitter was about 800 kHz, others have placed it around 100 kHz; there is much uncertainty in the historical accounts. This is further complicated by the unreliability with which frequency measurements could be determined in 1901. To overcome this uncertainty, Dr Jack Belrose, VE2CV, did extensive work with scale and numerical models. The two methods gave moderately consistent results for the frequency response of the fan-shaped Poldhu aerial, but suggested a resonant frequency of the antenna of about 850 kHz. 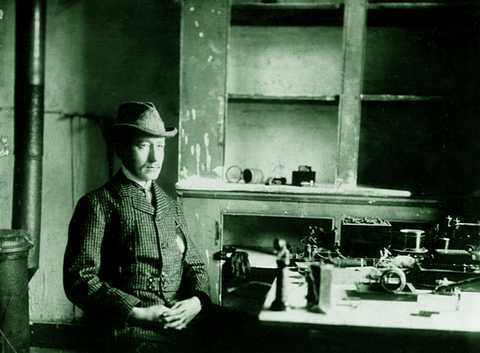 In addressing the Royal Institution, Marconi stated he could hear the Poldhu signals using untuned detectors, but not with a tuned receiver. Marconi attributed this to 'the varying capacity of the aerial wire' as the kite supporting it moved about in the wind. Two months later, he determined that the maximum distance over the Atlantic that the Poldhu transmitter could be detected with a tuned long wave receiver during the daytime was about 700 miles. This suggests that long waves were not detected in Newfoundland on December of 1901. Short waves would propagate across the Atlantic and would be rejected with a receiver tuned to long waves. Hence the historical information is consistent with the short waves comprising any signals that may have been detected. Whether there was enough radiation in the short wave spectrum to produce audible signals in St. John's without the aid of amplification is a point of debate amongst radio scientists. Dr Belrose has argued that the amount of short-wave radiation from Poldhu was not sufficient to be detected with the apparatus Marconi was using. Other authors have made a case in favour of Marconi. In the final analysis, we will never know for certain because the accuracy at which the frequency response of the Poldhu transmitter and aerial system can be determined is dependent on how well the details of its construction and operation are known. Most authors acknowledge this information is very sparse and often unreliable. This works in Marconi's favour: it cannot be proved conclusively that the system did not have a parasitic response in the HF region. Also, we must bear in mind that until Marconi achieved transatlantic wireless communications beyond a shadow of doubt in Glace Bay one year later, it was thought impossible. Science often does a better job saying what is possible than what is not, and at its most fundamental level, can tell us only about probabilities. Marconi was lucky to have received the signals. It may have been improbable, but not impossible. The commemorative plaque on signal hill. On the top of the image is the Atlantic Ocean which extends 3425 km to Poldhu, England. The small board on the bottom of the plaque is a home-built transmitter comprising only 12 components. It was used on Signal Hill to communicate with Poldhu on 12 December in 1996, 1997, 1998, 1999 and 2000. We are very grateful to Carolyn Rule, M0ADA, who operates the Poldhu Amateur Radio Club station GB2GM.